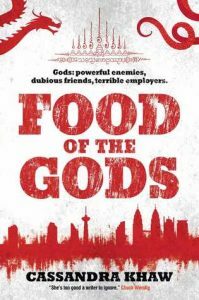 I borrowed a copy of Cassandra Khaw‘s Food of the Gods from my local library. In deciding how I feel about this book, I kept going back and forwards with the good and the bad. The good is definitely some first class writing, a character with a good wit and sarcastic mouth, some great nods to feminism (which also seemed to highlight the bum deal EVERY wife in the book seemed to get) and an interesting world. The bad was far, far, far too much gore. I don’t say this because I’m grossed out by viscera, but because I just got mindnumpingly bored of reading yet ANOTHER scene of some hapless human being shredded. (On a side note, how did hundreds of people keep disappearing and no police ever investigate?) And I could have definitely done with a glossary. All in all, I’d happily read more of the series. But I think I’ll step away for a breather first. As an additional note on this version of the book, the actual physical book, the font is very small. As are the margins and line spacing. (Definitely below average.) I admit I’m 40, but I don’t yet need reading glasses and I found this…maybe not difficult, but not easy to focus on and read. This entry was posted in books/book review and tagged book review, fantasy, urban fantasy on March 5, 2018 by Sadie.